Ensure the spark energy gets to the plug! Better Quality and more efficient than the OEM in every way. Don't starve your MINI of the very thing it needs to make a bang. 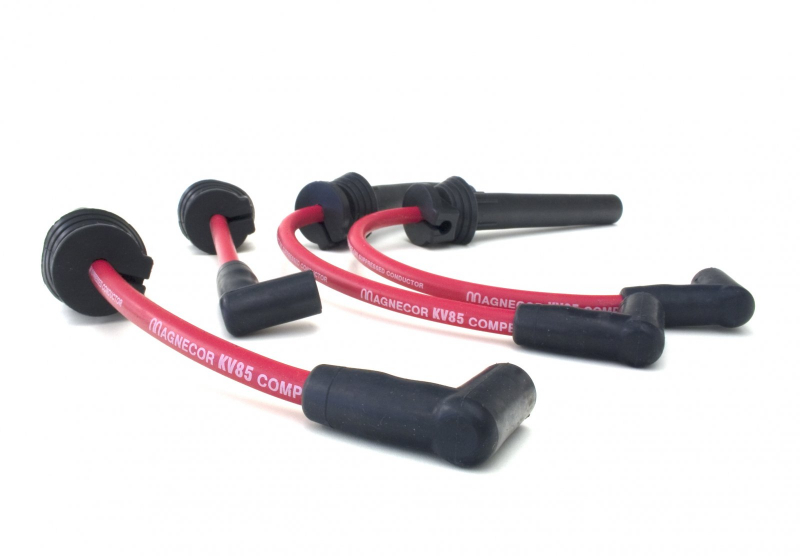 Magnecor Ignition cables feature Magnecor's exclusive 2.5mm high capacity Metallic Inductance EMI Suppressed conductor consisting of stainless steel wire precisely wound at 200 turns per inch over a ferrimagnetic core. The insulating jacket is made entirely of Magnecor's exclusive TC-1500-HS high strength aerospace grade silicone rubber, and its single layer construction will prolong the jacket's insulating ability by conducting extreme heat away from hot-spots that occur near over-the-limit heat sources. The KV85 8.5mm jacket has a service heat resistance of 600 degrees F (320 degrees C) and up to 1,000 degrees F (540 degrees C) for short burst 3 minutes. Even if limits are exceeded, the silicone rubber will retain its insulating ability until wires are removed from engine.